In December last year, I became the proud new owner of Leo (after Leonard Darwin), the son of Charly (Charles Darwin (my earlier machine)). It didn’t take 9 months to fully develop, but it seemed like a long time (the second and third sets of parts tooks just a week). I wanted a second machine to be less dependent on my first Darwin, in case it broke. After Leo made a few test objects that were okay, I never really printed with it anymore… why? It is time for Leonard to see more of the world, and be invited to the homes of other hackers who want 3D printers in their home! You can have fun with Leo and print yourself a set! Have him send postcards once in a while (not entirely unlike the Dwarf of Amelie’s father), or post pictures of his printing experiences on Thingiverse /derivative. There is one ‘catch’, if you use it to print one set, the new owner of this set has to print two of them with their machine (the Mini Mendel also counts, which you can print within a day’s worth of printing). You are encouraged to ask for the same adherence to the RepRap etiquette. If you print two sets with Leonard, you’re freed from this obligation (there are some time saving to printing everything twice). Let me know who will be the happy owner of the set. At some point I’d like to have Leonard return home. My requirement is that it’s not in a worse shape than the previous person to host him. If you’re thinking of really big changes to Leo, keep me in the loop. It includes a full Cartesian bot with a special modification I made to prevent jamming of the Z axis and so you’re able to use a continuous loop. It contains the BitsFromBytes control electronics which may need to be replaced with more open electronics (RR motherboard) or someone has to follow in my footsteps working on the OpenRapMan firmware. In other words, you’ll have everything to get it running. I’d like someone to be able to pick it up by car. I live in Tilburg, the Netherlands, so this offer is probably most attractive for people based in the Netherlands or Belgium, perhaps Germany. I want to see you in person before I’m letting you take Leo and I’m not shipping it since it’s fully assembled and because of the large dimensions (~50x50x60 cm WxDxH). Also, face to face I can provide some instructions on what parts of the machine may need some attention to get printing quality up. I’m pretty confident that the quality can be even better than my current RepRap because this one is so much more tidy and better studding and more ball-bearings were used. RapBoy likes the yellow improvements, and hopes to get them as he grows up. Very interesting offer! I live in Belgium and I’ve been following the RepRap revolution for quite some time now. But haven’t gotten into building my RepStrap yet… though I have gen3 boards waiting to be assembled… This could be the way to get started very fast! I am still stuck with my plastruder problems so I might take you up on the offer. I would not need 3 months though, just enough time to print a new plastruder off thingiverse and perhaps a mini-mendel or 2! I will give it some thought and let you know. Picking it up is not a problem, I am not far. I want to phase out the closed BfB electronics, so anyone willing to help replace them is more likely to create a win-win situation (takes some rewiring, but not too much). The BfB electronics do work, but you need to rescale .gcode files (I have written a script to do this available via the RepRap wiki). If you’re living close to eachother (perhaps Kieran and Lanquarden) you could collaborate if you like. I do want one person mainly responsible for it. I’ll wait for a few more people to see this call so that everybody gets a fair chance! Interesting – a lot of people talk about doing pay it forward type deals and talk about how quickly replicating printers will spread, but it hasn’t been happening. I guess it will all really take off once people begin to have 2 or 3 generations of printers and suddenly have one sitting unused like you. Once you have 3 printers, 1 suddenly looses a lot of value since having 2 means you can keep them both repaired and running forever. We really could use a reprap to bootstrap our workshop ‘Make your own RepRap’! * why not set up a blog where each new owner could document what he was doing? with the machine, the credentials could be passed on from one person to the next. that would create a real virtual identity for the machine. it would be very interesting to follow what is being done at each new home. * you could use the exponential equation at an (imagined) sweet spot if you lend the machine by priority to people who already have one. maybe that will reduce downtime and make prints faster and better. and so will make things more fluid overall which will bring more machines to more people! Great idea. Very cool to see a 3D printer on the move! I simply plan with a friend of mine who is psychiatrist and also artist to use the RepRap (I’ll may build thanks to Leonard) to help my friend and his patients create 3D objects in their creative process. Personally I planned to make one for fun and because I also started domotics and it would be very helpful to me for printing some physical parts around the electronics components. Anyway, thanks for this initiative! If I can print my own repraps, I’ll consider lending one too. Really interesting offer, really kind of you to offer. 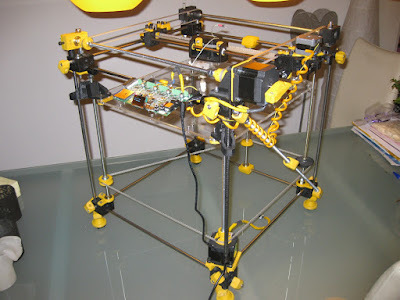 We are wanting to build also a reprap machine (a mendel), but of course we need to get the plastic parts somewhere. We are a art/technology/hacker duo, on-signal, Arjan Scherpenisse and myself. Arjan having software skills, me having hardware skills (mech.engineer). We are pro open source and do beleive in that. We both have a technical degree and an art degree. To be able to ‘host’ Leonard for a while, would be great. For us to produce another machine and also to already start to working with and learning the machine. For us a reprap is a great tool to make parts for new installations we come up with. Nice machine. I also live in the Netherlands and I’m currently looking into building one of these. But where can I get the plastics to feed the machine. I can only find those short hot-glue sticks. I would rather build one meself, since I build a lot of RC stuff and already have a CNC-mill and a lathe. But this thing would really make me the small parts I still have to buy. The printer that’s for loan would allow you to make the parts for your own 3D printer that you can keep. So, you can use the loaned machine to print something else, but mostly you should use it to “bootstrap” your own machine. This is only fair, as you can imagine, as others are waiting in line to print their machine! Soon, I’ll decide who gets the machine first. I’ve gotten a lot of responses so far, so I’m working on the order in which it will go. Hi Erik, great initiative. A friend and I have been wanting to build our own repraps for a while. I’m a concept designer for LEGO in Denmark and my friend is a designer of interactive installations in Rotterdam. Loads of (hobby) applications for both of us! I’m in Holland this July and we want to work together on a project. I see you already have many reactions, so I hope it will be possible somewhere in July, it can also be a short time (couple weeks). I live in the Netherlands aswell (Wageningen) and have been looking into getting a reprap setup going for my/our (to be) hackerspace. The other set will probably be going to a friend who also wants a mendel at his place. Ik wil zelf ook een reprap machine maken, bij voorkeur uit een kit. Zou je mij op weg kunnen helpen en kunnen aangeven waar ik het beste een kit kan aanschaffen? Hi ya all, I’m also very interested in this project. There’s no need to borrow the machine, I’ve got a CNC-router, I do however need the extruder and all that goes with it, so maybe you could put me on the right track. And oh, I live in the Netherlands too.